Written in 1924 by Eugene O'Neill, Desire Under the Elms, is a story that explores profound human connections and the depths that people will go to have what they desire. Inspired by the myth of Phaedra, Hippolytus and Theseus, O'Neill's story is set in New England where patriarch Ephraim (Darren Mort) returns to his home in New England with new wife, Abbie (Diana Brumen). This does not bode well with his three sons (Garikai Jani, Timothy Smith and Sam Lavery) as the tension builds to a devastating end. Lavery perfectly encapsulates youngest son's Eben's resentment towards his father and the rage that burns inside him, yet at the same time brings to the surface the tenderness and love that he can also feel. His scenes with Brumen are gripping and you're never quite sure which way their story is going to go, even if it is based on a Greek tragedy. Brumen's manipulative and scheming Abbie is convincing, but it is during her horrific and tragic final scenes that she is able to channel everything Abbie has been experiencing until that moment. Director and founder of The Sol III Company, Andrei Schiller-Chan does a brilliant job in portraying these characters' emotions and thoughts beyond the words of the play, in particular the scene where Ephraim reminiscences about his past loneliness to Abbie. Having Ephraim off to the side, we are drawn into Abbie and Eben's private, silent conversation from Abbie's bedroom to Eben standing downstairs in the kitchen. The fight scene between the father and son is also powerfully executed and choreographed. While at times, the story does seem to slow down significantly in pace, with a sense of repetition in the scenes being played out, the cohesiveness of the technical and design elements continue to keep us intrigued. Production designer Hahna Read's set, despite the limitations of the physical space on the stage, has a firm feeling of authenticity and the waft of bread baking throughout the space further added to that. 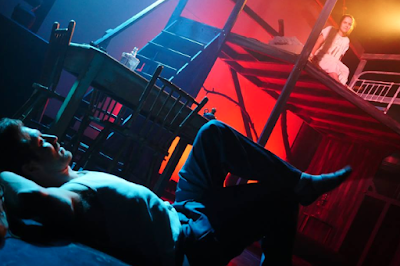 Travis MacFarlene's elegant lighting design is used effectively to convey the emotions and thoughts of the characters while subtly supporting the mood of the play. Similarly, Paul Raine's sound design is evocative and adds adroitly to the environment of the farmhouse in which the story is situated. Desire Under the Elms is a tale about ancient and basic human emotions; love and jealousy. It's about growing up, letting go - and also revenge. Similar to their production last year of The Exonerated, The Sol III Company excel in exploring these universal but complex themes and have created another thoughtful and captivating performance in Desire Under the Elms.